Ralph Hobbs will again be running the Trust’s moth trap at the Quarry Wood Reserve, Crowhurst. The trap will be set up overnight from 8pm on the Saturday evening. All are welcome to view the moths when the trap is opened at 10am on Sunday. Please park in the Crowhurst recreation ground car park, then it’s a few minutes’ walk up Sandy Lane to the reserve entrance gate which will be clearly visible on the left. A map of the Crowhurst reserve and entrance can be found on the ‘Our reserves’ tab. Please scroll down to “Regular Working Parties” to see the latest information on volunteering at our conservation work day events (updated 9th October 2016). The annual hay cut is one of our most enjoyable social events of the year, usually with plenty of wildlife to be seen on the day! Everyone is welcome – members, friends, and family etc so please do consider joining us on the day, or even for part of the day. Rakes etc are provided but please bring your own lunch and drinks. Further information on our News and Updates page. This year there will be no pre-arranged summer guided walk, but members are always encouraged to visit our showpiece woodland reserve to view the superb bluebell displays and other spring and summer flowers at any time from early spring until around mid-October. The flowering of Bluebells is later than last year, and seems likely to span the first 3 weeks of May this year. Appropriate footwear is always advisable as some of the paths and steps can be muddy or a little slippery, especially straight after rain. Parking is available in the reserve car park – please refer to your Spring 2015 Newsletter for further information. The Trust will run its moth trap on the Crowhurst reserve overnight from late Saturday evening on 18th July. All are welcome to view the moths when the trap is opened by Ralph Hobbs at 10am on the Sunday morning. Children are especially welcome, accompanied by an adult, but sorry dogs and moths do not mix! Please park in the Crowhurst recreation ground car park, then it’s a 5 minute walk up the lane in the St.Leonards direct to the reserve entrance gate which will be made clearly visible. The Crowhurst reserve map can be found by clicking on the ‘Our Reserves’ tab above. This will be the first time a moth trap has been set up on this reserve so many records are likely to be new ones! Only in the event of heavy rain overnight is the event likely to be cancelled, but please note the paths may be muddy so appropriate footwear is recommended. Enquiries to Ralph Hobbs on 01424 752878. This year’s annual meadow cut and rake is on Sunday 19th October 2014 from 10am til 3-ish, and we still need a few more volunteers please – many hands make light work! This is also one of the most enjoyable social events of the year, usually with plenty of wildlife to be seen on the day. Everyone welcome, members or not, so please do consider joining us for the day or even part of the day. There is no guided walk arranged for this year, but members are encouraged to visit our showpiece woodland reserve and view the superb bluebell displays and other spring flowers at their own convenience from April onwards. The peak for Bluebells is likely to be the middle two weeks in April this year, perhaps to the end of April, but in any case much earlier than last year! Appropriate footwear is always recommended as some of the paths and steps can be muddy or a little slippery if it has been wet. Parking is available in the reserve car park. All welcome, especially children accompanied by an adult, but sorry no dogs. Enquiries to Barry Hawkins, Reserve Manager - 01892 852120. Saturday 28 June at 2pm. WE ARE VERY SORRY THIS WALK HAS HAD TO BE CANCELLED. Once again there will be a guided walk around the reserve to view the wildflowers, birds, butterflies, dragonflies all of which we have been trying to encourage by recent conservation work. Appropriate footwear is recommended as some parts of the reserve can be muddy or a little slippery if it has been wet. All welcome, especially children accompanied by an adult, with any dogs under close control please. Enquiries to Derek Bates, Reserve Manager – 01424 425538. Thursday 3 July at 9pm AND Friday 4 July at 9am. The moth trap will be set up at Powdermill Wood as part of the nationally co-ordinated ’Moth Night’ which this year has the theme ‘Woodland moths’. Accordingly, the July dates have been set for when woodland species should be at their peak, though this does mean it will be nearer 10 or 10.30pm before we can expect moths to start to arriving! On the Thursday evening we will see the first moths coming in and be able to examine them in torchlight as they arrive, then and on Friday morning we will be opening the trap to view the settled moths at our leisure and take close-up photos etc. Appropriate footwear is recommended as some of the reserve can be muddy or a little slippery if it has been wet. Please note that this event will be cancelled in the event of steady rain. Parking is in the Powdermill Wood car park. All are welcome to either session or both, especially children accompanied by an adult. Sorry no dogs. Enquiries to Ralph Hobbs, Chairman - 01424 752878. We shall be pleased to see any volunteers at any of our working parties. We supply all the tools and we give instruction in the use of them. No matter who you are or what age you are, we can find a job to suit everyone. There are no fixed hours for starting or finishing, but we like to start at 10.00 am with breaks for coffee, lunch and tea in the afternoon. We look forward to seeing you in the green gym! 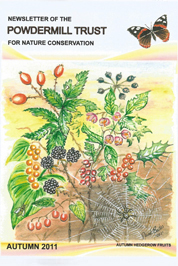 The Hastings Conservation Volunteers website http://hastingscv.btck.co.uk/TaskProgramme gives details of conservation work party days at local sites including our Powdermill Wood reserve. First Tuesday monthly and third Sunday monthly days NB this arrangement is now on hold (until a new reserve manger can be found and whilst fencing is installed to facilitate grazing). Last Sunday quarterly (phone for confirmation). Maintenance working party are carried out in October, January and May.